The Truth. Or, many truths. One truth contradicts another. Nothing remains as true. 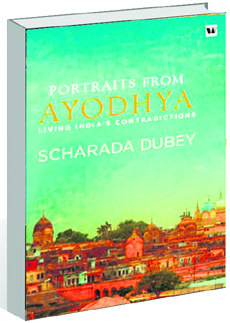 "Truth lies in paradox," rightly says Scharada Dubey in the foreword to Portraits from Ayodhya, her 13th book. Two decades after the demolition of Babri Masjid, the author, who lives in Faisalabad and has been visiting Ayodhya, presents 25 local voices in her work of oral history. The idea is not to unravel the truth but, rather, highlight the contradictions about the past and even the present of a city that has often been seen as a synonym of a troubled India. The media has little time and space for the stories behind the truths. So, Portraits from Ayodhya, in a way, narrates the tales behind the news. The land in the Babri Masjid-Rama Janmabhoomi area came under dispute in 1885, when the first suit was filed claiming rights over it. In 1950, the matter was revived in the courts through a clutch of suits that had continued at least till 2011. Another, perhaps, missed out fact has been that idols and other objects of worship were placed in the structure on the night of December 22-23,1949, as Ram Sharan Das (one of those profiled) recollects: "Mahant Digvijaynath instructed ‘Go and keep the idols in the masjid.’ I was present in this meeting, so I know how seven people were appointed for the…"
The book, however, is not an attempt at tracing the steps of the "movement for a Ram temple" at Ayodhya, neither is it finding a justification through re-reading of history. Instead, Dubey focuses on the people and the dispute per se. The emotion, agony, contention, killings, misery and irony, is what she cuts through while profiling people who have been part of the city. She divides them into three categories, mavericks who had exploded onto the Ayodhya scene, the figures in the administration and the common people. One might sense a disparaging tone when Dubey talks about the RSS or the saffron-brigade, but the reader is allowed to draw his/her own interpretation. The portraits include those of a wrestler-sadhu and devotee of Hanuman who dreams of a temple at the disputed site; a young neo-Buddhist fighting for compensation for his family land that was usurped by the Uttar Pradesh government; and a much sought-after astrologer who continues her scholar-father’s tradition of resisting the hold of sadhus over Ayodhya’s intellectual and cultural life, there is a firebrand proponent of secularism who broke away from the Sangh because of the cast prejudices inside the organisation. Nevertheless, a truth does come out: ordinary people are not communal. For, how would Yugal Kishor Sharan Shastri still be breathing after having committed "an unforgivable crime". In the section on the administration, Dubey brings out both the indifference on the part of those in position and a genuine effort from those on the receiving end. On one end is the uninterested king, so deeply entrenched in his Earl Gray tea lifestyle that there is absolutely no connection between him and his subjects and, on the other, is the humble home-maker turned chairperson of the Municipal Council grapples with the lack of staff and funding to keep the streets clean. The final section, and the largest, deals with the common people: A young girl, enthused by Mayawati's pro-Dalit campaign, chooses to question the norms about gender and caste in her own quiet way but loses out to a Bramhin driver when she tries to go for a public post. Or, the astrologer who does not need clairvoyance to be able to predict that the political parties will not leave Ayodhya in peace. Like a journalist, who feels that the Hindutva cry is misleading people but is equally hurt by the defiling of Hindu deities. The book is a must-read not for any other reason but to know how places are supposed to be defined by people, and not the other way round.